Total RNA purified from 293T cell extracts, either mock transfected (-) or transfected with a DNA construct expressing full-length human METTL3 (hMETTL3; +), were blotted onto a nylon membrane, UV cross-linked, and probed with N6-methyladenosine (m6A) (D9D9W) Rabbit mAb. The top panel shows the antibody detecting more methylated adenosine in cells overexpressing METTL3, while the bottom panel shows the membrane stained with methylene blue. Poly(A)+ RNA purified from 293T cell extracts, either mock transfected (-) or transfected with a DNA construct expressing full-length human METTL3 (+), were blotted onto a nylon membrane, UV cross-linked, and probed with N6-methyladenosine (m6A) (D9D9W) Rabbit mAb. Specificity of N6-methyladenosine (m6A) (D9D9W) Rabbit mAb was determined by ELISA. The antibody was titrated against an RNA oligo containing either unmodified adenosine or N6-methylated adenosine (m6A). 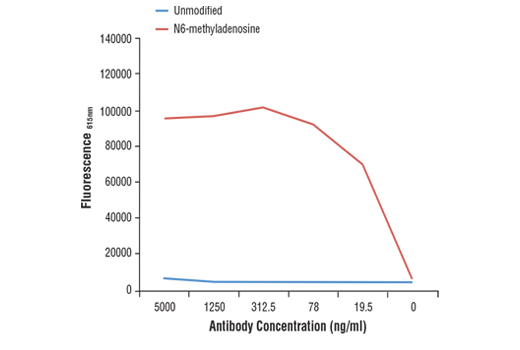 As shown in the graph, the antibody only binds to N6-methylated adenosine (m6A). Specificity of N6-methyladenosine (m6A) (D9D9W) Rabbit mAb was determined by competitive ELISA. The graph depicts the binding of the antibody to a pre-coated m6A oligonucleotide in the presence of increasing concentrations of differentially modified adenosine. 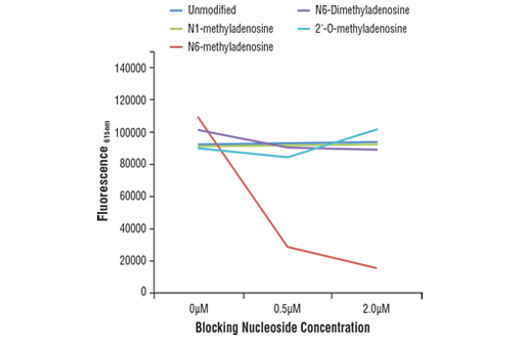 As shown in the graph, antibody binding is only blocked by free m6A nucleoside. This antibody has been shown by an independent laboratory to work in RNA-IP-seq. Please use at an assay-dependent dilution. N6-Methyladenosine (m6A) (D9D9W) Rabbit mAb recognizes endogenous levels of N6-methyladenosine (m6A). 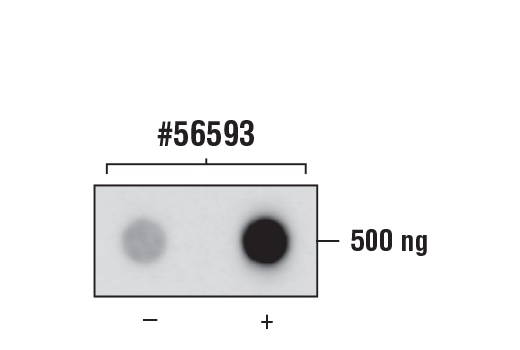 This antibody has been validated using ELISA and dot blot assays and shows high specificity for m6A. This antibody does not cross-react with unmodified adenosine, N6-dimethyladenosine, N1-methyladenosine, or 2'-O-methyladenosine. Monoclonal antibody is produced by immunizing animals with N6-methyladenosine. N6-methyladenosine (m6A) is a post-transcriptional modification found in various RNA subtypes. While the presence of m6A in RNA was described decades ago, the lack of tools has made interrogating the epitranscriptomic landscape challenging (1,2). With the emergence of new technologies such as miCLIP and NG-RNA-seq, researchers have been able to show that m6A is a biologically relevant mark in mRNA that is enriched in 3’ UTRs and stop codons (3,4). The m6A writer complex consists of a core heterodimer of methyltransferase-like protein 3 (METTL3) and methytransferase-like protein 14 (METTL14), and the additional regulatory proteins Virlizer/VIRMA and Wilms tumor 1-associated protein (WTAP) (5). 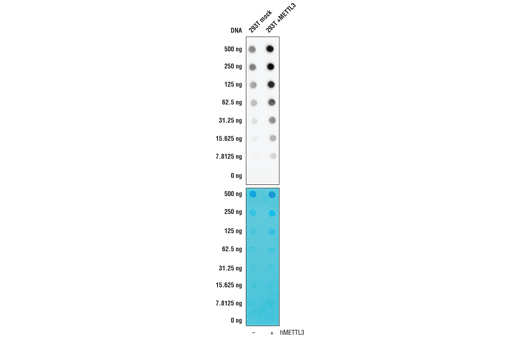 METTL3 is the catalytic methyltransferase subunit and METTL14 is the target recognition subunit that binds to RNA (6). The Virilzer/VIRMA protein directs m6A methylation to the 3’ UTRs and stop codons, and WTAP targets the complex to nuclear speckles, which are sites of RNA processing (7). Less is known about readers and erasers of m6A, and while the fat mass and obesity-associated protein FTO was the first discovered m6A demethylase, subsequent studies demonstrated that this enzyme may prefer the closely related m6Am mark in vivo (8,9). ALKBH5 was later shown to be a bona fide m6A demethylase enzyme, contributing to the idea that the m6A modification is dynamically regulated (10). Readers of the m6A mark include the YTH protein family, which can bind to m6A and influence mRNA stability and translation efficiency (3,11-13). The m6A mark and machinery have been shown to regulate a variety of cellular functions, including RNA splicing, translational control, pluripotency and cell fate determination, neuronal function, and disease (1, 14-17). The m6A writer complex has been linked to various cancer types including AML and endometrial cancers (18,19). Additionally, m6A has been implicated in resistance to chemotherapy (20). Meyer, K.D. and Jaffrey, S.R. (2017) Annu Rev Cell Dev Biol 33, 319-42. Desrosiers, R. et al. (1974) Proc Natl Acad Sci U S A 71, 3971-5. Dominissini, D. et al. (2012) Nature 485, 201-6. Meyer, K.D. et al. (2012) Cell 149, 1635-46. Liu, J. et al. (2014) Nat Chem Biol 10, 93-5. Wang, X. et al. (2016) Nature 534, 575-8. Ping, X.L. et al. (2014) Cell Res 24, 177-89. Jia, G. et al. (2011) Nat Chem Biol 7, 885-7. Mauer, J. et al. (2017) Nature 541, 371-75. Zheng, G. et al. (2013) Mol Cell 49, 18-29. Schwartz, S. et al. (2013) Cell 155, 1409-21. Wang, X. et al. (2014) Nature 505, 117-20. Wang, X. et al. (2015) Cell 161, 1388-99. Batista, P.J. et al. (2014) Cell Stem Cell 15, 707-19. Batista, P.J. (2017) Genomics Proteomics Bioinformatics 15, 154-63. Patil, D.P. et al. (2016) Nature 537, 369-73. Wang, C.X. et al. (2018) PLoS Biol 16, e2004880. Barbieri, I. et al. (2017) Nature 552, 126-31. Liu, J. et al. (2018) Nat Cell Biol 20, 1074-83. Dai, D. et al. (2018) Cell Death Dis 9, 124.